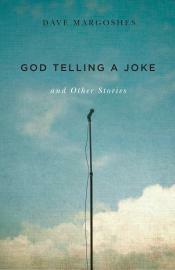 God Telling a Joke and Other Stories is a collection of new stories by the author of Bix’s Trumpet and Other Stories, named Book of the Year at the Saskatchewan Book Awards and a finalist for the ReLit Award in 2007, and A Book of Great Worth, one of Amazon.Ca’s Top Hundred Books of 2012. Among the characters in the collection’s 16 stories are a 99-year-old stand-up comedian wearily challenging God to deliver the punch line; a lightning strike survivor whose luck finally runs out; a Princeton-educated trapper who transforms himself into the King of the Jews; a young Second World War veteran unable to talk another vet out of suicide; a carnival sideshow “geek” with a glass jaw; a stroke victim who suffers a different type of heart attack; and a writer dubbed by an award jury as “a connoisseur of longing.” The stories range from laugh-out-loud comedy to wry satire to heart-wrenching romance to sober meditations on the nature of beauty, truth, life and death. The stories show Margoshes, a master story-teller, at the top of his game.